Most people know Jef Staes as a keynote speaker and author (www.jefstaes.com) but his real passion and talent is system thinking in the field of organizational development. This challenging quest has resulted in compelling metaphors and a mindset to transform organizations into agile and disruptive ‘Engines of Innovation’. His best-known concept is ‘Red Monkey Innovation Management’, a disruptive view on the need for embracing passion and talent and the resulting impact on learning, working and innovation. People who have attended one of his keynotes or read one of his books will never forget this metaphor. Today, this wait is over. We have developed the Engine of Innovation Mindset Map and the Engine of Innovation Toolkit to make this happen. 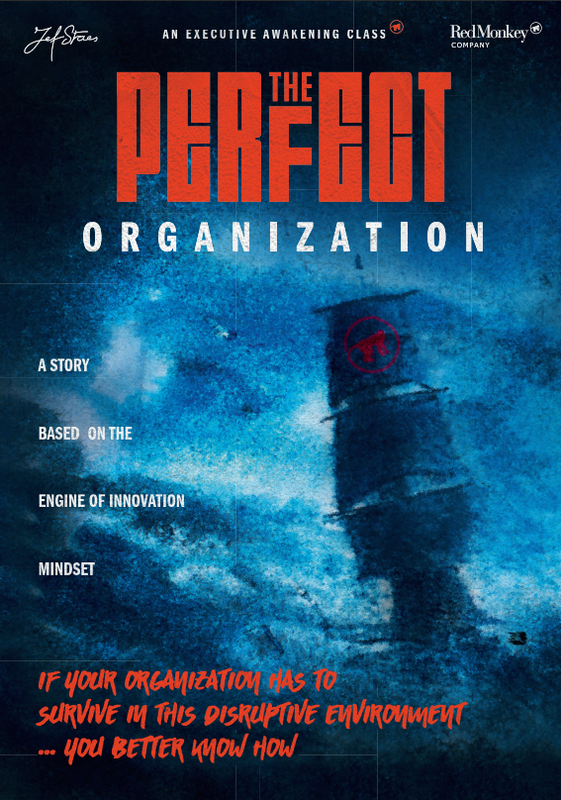 With ‘The Perfect Organization’ we bring an executive awakening session to the market. The poster of this session is inspired by the movie ‘The Perfect Storm’. A dramatic story of fishermen confronted with a perfect storm. The movie ends dramatic, they all die. With ‘The Perfect Organization’ we give you all the insights needed to survive the dramatic storm of disruption we are facing today. The only thing you need, is the courage to question all your paradigms about organizational development and open your mind to a different mindset. Boosting the learning and innovation power of organizations is not anymore, a question of training and development. It’s more a question of getting the right people with the right passion and talents in the right roles. Real learning and disruptive innovation are a result of this casting process. The reason why organizations fail to adapt to this era of information luxury and disruption is not because it is not possible but because they lack the bravery and strategy to give the right authorization to the right experts, the right managers and the right executives. After this awakening, your mind will become disrupted. It will be touched by the power of the Engine of Innovation Mindset and its holistic approach to organizational development. We must boldly go for Disruptive Business Innovation powered by Engine of Innovation Culture Innovation.